As a rule, I'm generally not fond of surprises, but last month when I opened an email from Amazon UK and discovered that Arnaldur Indridason had another Erlendur novel out, I almost figuratively fell out of my chair. After Strange Shores I figured "this is it - another one of my favorite series has come to an end," and went into figurative mourning. Now I am happy to report that Erlendur is back -- albeit as a young patrolman on the night shift -- in a prequel to the entire series. A little online searching also reveals that there are two regular series novels left untranslated & unpublished (the two preceding Jar City) and one more prequel called The Match set in 1972, two years before the setting of Reykjavik Nights. I have to wonder why we're getting the second prequel before the first, meaning, who made that decision -- but the fact that there is possible potential for three more Erlendur novels to come out in translation makes me a little hopeful for the future. Obviously I am a huge fan -- no, that's not quite it -- I actually love this series. On his regular shift one night, young patrolman Erlendur receives a report that takes him to the scene of the drowning of a homeless man who went by the name Hannibal. Since it didn't seem to investigators that there had been any foul play, CID assumed that Hannibal's death was an accident, and the case goes cold. After all, the man was known to be a tramp, CID "had other fish to fry," and basically "no one seemed interested." Erlendur, however, had known Hannibal prior to his death, having crossed paths with him now and then, and just shortly before Hannibal's death, had listened to Hannibal when he'd claimed that someone had set fire to the cellar where he was living. Like everyone else, Erlendur didn't believe him. Now, a year later, while Hannibal is just a name on a file tucked away somewhere in police archives Erlendur can't forget him. Flying under the radar of his superiors, he decides he has to find out what really happened to this lost soul that night. But Hannibal's case is just one of two cold cases Erlendur can't forget. The case of a missing wife from the proverbial other side of the tracks in one of Iceland's better neighborhoods haunts him as well. People who dismiss crime fiction and sneer at "genre" fiction in general obviously haven't read Indridason. Aside from his ability as a crime novelist who creates intriguing plots and characters who grow and develop throughout a long-running series, he is also an incredibly strong writer. As just one example to highlight his talent in this area, there is a brief scene that caught my eye in this book where Erlendur wonders why he's so "fixated on the fate of some poor tramp:"
"Whatever it was, something about Hannibal's sad story had captured Erlendur's imagination. His fate, yes, but also his dogged determination to withdraw from human society. Where had this need come from? What had caused it? Erlendur sympathised with his loneliness and mental anguish, and yet there was some element of his character -- the uncompromising fact of his existence -- that was also strangely alluring. The way he had set himself against life and stood, alone and untouchable, beyond all help." Now, I ask you how often do you run across writing like this in your standard crime fiction novel? Rarely. The very best element of Reykjavik Nights, however, is not found in the crimes, in the idea that true evil doesn't discriminate between the best and worst neighborhoods in any city, in the social issues, or even in Erlendur's clandestine investigations. It lies with Erlendur Sveinsson himself. Even though he's very young and hasn't yet started on the career path as a detective ending up with the dream team of colleagues Sigurdur Oli and Elinborg, the Erlendur whom readers know from the regular series novels is all anchored right here -- the loner, the traditionalist, the seeker of lost souls. Since I know how things are going to turn out for him later, I found myself, for example, actually upset when he started dating future ex-wife Halldora, because well, as everyone knows, that's just not going to turn out well. It hit me while reading this book just how very much I've ended up investing in Erlendur over several years -- that may sound kind of stupid since he's a fictional character, but I suppose it means that Indridason has created a character whose life I actually cared about. I can't honestly say that about most the characters in most crime fiction novels I read. Personally, I think this book works best for people who've already read the entire series (at least the ones that have been translated), although it can most definitely be read as a standalone. It's much more simplistic than the other novels, and I'm inclined to believe that the author did that on purpose to keep the focus on Erlendur himself, rather than on the crimes. I appreciated the obviously slower pace for that very reason. I bought my copy in the UK; I'm looking at Amazon and I see that as of right now, it's not slated for American publication by Minotaur until April of 2015 (9781250048424) . That's so long from now, but trust me -- if you can't pick it up sooner, it will definitely be worth the wait! "The game cositts o' doin' a most damage y'can do to the apposing couple, who'd be the avversary, bu' also trying' a proteck y'r own partner from danger." --- Catarella, 226. It is so nice to finally get back to my original big giant pile of crime fiction novels that have just been sitting here stagnating for what seems like forever. And what a way to start, with one of my all-time favorite crime novelists, Andrea Camilleri. 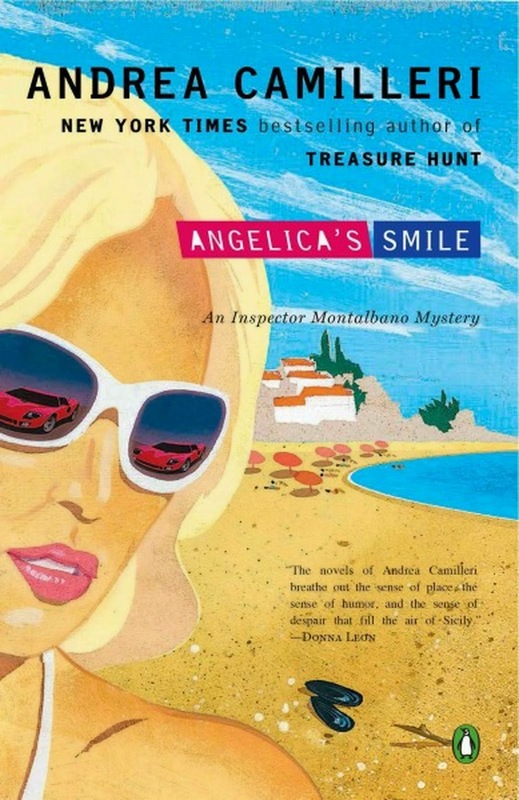 Angelica's Smile is seventeenth in Camilleri's Montalbano series, with what seems to be four still yet to be translated into English. As usual with these books, the focus in this story isn't so much on the crime or the crime solving, but instead on Montalbano and the people surrounding him. This one is a little more on the personal side, with less reference to the social, economic and political issues that Camilleri usually brings to his work. Our beloved inspector is now just two years short of sixty, and as in the last few books, he continues to muse about aging and growing older throughout the novel. He's still with long-time girlfriend Livia, and as the story opens, she is at Marinella with him for a few days. As he's worrying about someone named Carlo she mentioned while talking in her sleep, and getting more upset by the moment, he is called to the scene of an odd burglary. The couple that was robbed had been at their seaside home, where they'd awakened at six a.m. only to discover that they'd been "knocked out with some sort of gas," while the burglars "had the run of the place." It was their anniversary, and they were entertaining each other at the time, so neither person heard any sort of break in. Among a long list of valuables taken from the seaside house, the thieves stole their car and then proceeded to rob their regular residence. The only people who knew that the couple were going to be away were fifteen of their friends. As things turn out, there had been another burglary, "an exact duplicate," just three days earlier - and it isn't too long before the same thing happens again. When Montalbano is called out on yet another, he meets the titular and beautiful Angelica, the victim and also the "spitting image" of a woman he used to lust over as a teen in Dore's illustrations of Ludovico Ariosto's 1516 work Orlando Furiosio, a "poem about war and love and the romantic ideal of chivalry." After seeing her for the first time, he's immediately swept off his feet -- and definitely attracted. But even while he's mentally and physically lusting after his Angelica, as well as playing the role of her rescuer, there is still a number of crimes to solve -- including a murder -- and as an added distraction, the mastermind of the crimes is taunting the police, and then there's Livia, of course. While it's pretty funny to see Montalbano as a loopy, lovesick puppy completely smitten by this reincarnation of his teenage fantasies, and while Camilleri continues his long-standing tradition of inserting colorful characters into the mix, let me offer a word of warning here as far as the crime solving goes. I made the huge mistake of going to Sartarelli's notes in the back re the poem Orlando Furioso (a natural inclination), and twigged the entire plot all at once. Not the why of it, mind you, but trust me - if you read carefully, it's all there metaphorically speaking. I figured out much more than I should have at an early stage, and ended up being disappointed, and that's not an adjective I generally use when it comes to this series of books. And then there's this: I'm wondering if the author is getting a little tired -- this book just didn't seem to have the same oomph as his earlier Montalbano adventures that have been so lively up to this point. Still, it's a fun read, and in that vein I have to say that I probably haven't had so many good laughs with any other crime fiction series as I have with this one. Like I've said before, you don't read Camilleri's novels for the crime -- it's all about the characters.